Patients in intensive care units may be most at risk from so-called superbugs, according to a study. Researchers in Sweden have found evidence to suggest that bugs that are resistant to antibiotics are thriving on these wards. They carried out tests on 20 seriously ill patients at Huddinge University Hospital in Stockholm. Writing in the journal Critical Care, they said 14 had caught bugs from other patients in their unit. Many of these bugs were resistant to antibiotics. Up to 21% of the bugs were resistant to as many as six different types of antibiotics. Some 34% were resistant to five types of antibiotics while 59% were resistant to at least four. None was resistant to vancomycin, the antibiotic of "last resort" used to treat the dangerous superbug MRSA. Professor Charlotta Edlund and colleagues at the Karolinska Institute took swabs from the patient's airways and analysed the genetic fingerprints of bacteria grown from them. This enabled them to track the route of transmission of each of the bugs. The scientists investigated the transmission of several strains of Staphylococcus bacteria, called CoNS. These are the third most common cause of hospital infections. They found that a total of 14 individuals had either passed on a bacterial strain to another patient, or received one from another patient. In one case, bacteria appeared to have passed from one patient to another who was only admitted after the first was discharged. This suggested that the bugs had survived in the ward either on staff or other patients. "These species have the ability to survive in the ICU (intensive care unit) surroundings on medical devices and equipment for weeks up to months," said Professor Edlund. The researchers believe that in some cases these bugs survived on ventilation equipment, used to help these critically ill patients to breathe. 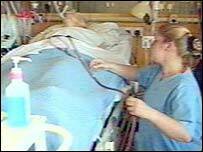 The researchers said the findings highlighted the need for strong infection control measures on intensive care wards. "Local guidelines for antibiotic use, close co-operation with infectious diseases specialists and restrictions with invasive treatment are strategies that can improve infection control and lower the incidence of hospital infections," said Professor Edlund. "Hand hygiene among hospital staff is an important factor for preventing these infections." Dr Saxon Ridley, president of the Intensive Care Society, said UK hospitals took steps to protect patients from superbugs. "Equipment is rigorously cleaned and sterilised and single use items are now widespread," he told BBC News Online. "However, problems occur because patients can literally get covered in these superbugs when a member of staff moves from one patient to another." "It is a serious risk for patients in intensive care units. They are under enormous physiological stress and their ability to fight off infection is reduced."